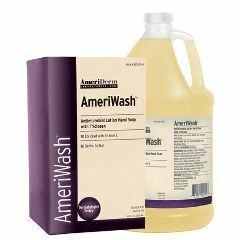 AmeriWash Antimicrobial Lotion Soap with Triclosan is made especially for the healthcare industry. Ideal for use in hospitals and nursing homes. Great for Before/after patient care. The picture showed a bottle, but the soap came in a plastic bag, meant to be used with a dispenser that I do not own. I put the soap in a plastic bottle and it works fine. Reasonably priced, too.